While it’s true that as you age your rate of hair growth slows, hair falling out or thinning can affect men and women of any age. Hair loss at a young age is more common than you might think. 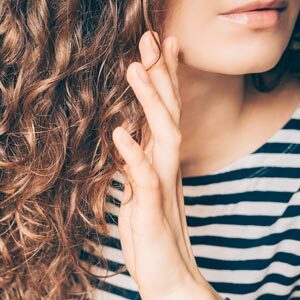 So, if your hair is thinning, you should know that it could be anything from change in hormones, improper diet, stress, unhealthy hair habits, genetics, medical conditions, illness or even cosmetic procedures such as bleaching or perming. An estimated 40 percent of men will have noticeable hair loss by age 35, and an estimated 40 percent of women will have visible hair loss by the time they are 40. But we don’t have to sit around and wait for more hair to fall out. There are six vitamins known to reverse hair loss and deliver longer, stronger hair. If you’re shedding more than usual and noticing your hair isn’t as thick as it used to be, like I was, it’s time to start taking a B complex vitamin. There are two B vitamins that are especially important to the health of your hair — biotin and B5. One study showed that vitamin B5 not only increases the thickness of each hair shaft, it makes them more pliable to prevent breakage. Another vitamin deficiency that could be responsible for your hair loss is iron. Did you know that all of the toxins you’re exposed to on a daily basis — from the air you breath to the chemical you use to clean your home — play a role in the aging process. And one of the simplest ways to combat this process is by taking antioxidants, like vitamin C, to reverse this free radical damage. The omega-3s found in fish oil have been proven in scientific studies to prevent hair loss, increase hair growth, make your hair thicker and even boost the diameter of each one of your individual hair follicles. To see the most benefits, take 1,000 mg of fish oil daily. My go-to is Peak Krill Oil™. It has a phospholipid structure that makes it readily absorbable by your body. Studies show that the lower your levels of zinc, the more likely you are to suffer from either female or male pattern baldness. Although not technically a vitamin, resveratrol is another antioxidant that fights aging, like the vitamin C we talked about above. It’s found in the skin of red grapes and helps to prevent damage to your cells, including your hair follicles.